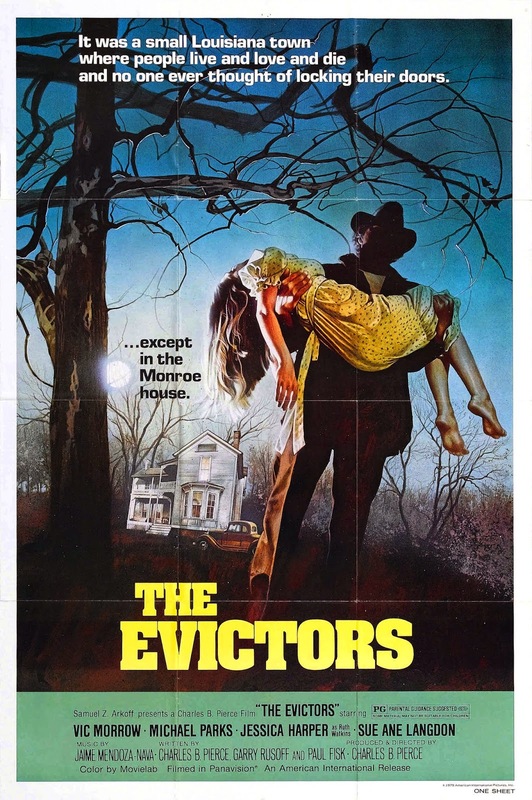 There’s a case to be made that the seldom-seen The Evictors (1979) is actually Charles B. Pierce’s best horror film. Exhibit A: The Evictors doesn’t boast the lapses into amateurism that mar The Legend of Boggy Creek (1972). Exhibit B: The film doesn’t feature the bizarre lapses in tone one finds in The Town That Dreaded Sundown (1976), either. Exhibit C: Finally,The Evictors features better performances and far more effective scares than the miserably bad Boggy Creek II: And the Legend Continues (1985). Instead, The Evictors is a kind of back-to-basics horror film all about a woman alone in an isolated setting (a farm house), contending with a frightening, relentless intruder. These scenes of terror (set in 1942) are cross-cut with quasi-documentary style sequences (presented in sepia tone coloring) of historical attacks in the same house, set in 1934 and 1939. By cutting between the scenes in the past (which ended badly for the home’s residents) with scenes from the movie’s present -- in which another character must overcome the same menacing individual -- a genuine sense of suspense is generated. In short order, we start to understand the house's history of horror and recognize Harper as only the latest, but not the last, victim. You may cry foul over the film’s final twist or surprise, which suggests that a character would keep using broken glasses for nineteen years, but The Evictors nonetheless manages to impress, both in terms of its production values (and period detail), and visceral impact. In short, this is one of those diamonds in the rough, a real sleeper, that more horror fans should take a look at. In mid-summer 1928, a representative of Shreveport Union Bank attempts to deliver an eviction notice to a rural farm-house that belongs to the Monroe Family. Because he has failed to do so on previous attempts, the bank officer brings heavily-armed Federal agents this time. A confrontation ensues between the family inside and the agents of the law, with the Monroes believed gunned-down. In 1942, real estate agent Jake Rudd (Vic Morrow) sells the long-vacant Monroe house to a young married couple, Ruth (Jessica Harper) and Ben Watkins (Michael Parks). Rudd doesn’t share any information about the house’s violent history, but Ruth soon learns that former owners were murdered in 1934. Later, she hears from a crippled neighbor, Mrs. Gibson (Sue Ane Langdon) that another couple died there as well, in 1939. The husband was electrocuted and the wife was burned alive. Soon, Ruth begins seeing a strange intruder, wearing overalls, lurking around the house by night. Ben’s job often takes him away, to Shreveport, but he asks the town sheriff to patrol near the house, and then teaches Ruth how to use a gun. Ruth, however, wants to move. In some significant sense, all of Charles B. Pierce’s horror films deal with man’s connection to the land, or to his home. In The Legend of Boggy Creek, the Fouke Monster terrorizes the locals, but the film spends as much time introducing the storied people of the town as it does contending with the monster itself. Similarly, The Town That Dreaded Sundown (1976) finds the folks of Texarkana under siege, fighting for their very homes against a ruthless, inexplicable killer. The Evictors -- which commences with the claim that it is based on a true story -- concerns what occurs when a family feels it has been displaced from its rightful land, its rightful home. The “evictors” of the title are not just the bankers and agents of the film’s first scene, but the murderous stranger and his hidden accomplices who use lethal force to keep “their” farm house unoccupied. If they can't live in their own home, no one will. At least not for long. The Evictors thrives as the most consistent and suspenseful of Pierce’s films in part because the director sticks, largely, to that parcel of land upon which the Monroe House stands. There isn’t a lot of back forth, or opportunities for slapstick humor or car chases. Instead, Pierce crafts a sense of unnerving, unrelieved claustrophobia because Ruth (Suspiria’s Harper) really seems to have no hope for escape. She begs her husband to move, but he doesn’t acquiesce. Meanwhile, he is constantly going away on business trips or working late at the local town factory. He is almost never home when he is needed, and so we get the sense, after a while, that a confrontation between Ruth and the stranger is inevitable. She can’t escape that fate. In some way, this element of the story may be a sly commentary on what it meant to be married in the 1940s, at least from a woman's perspective. Ruth has no say in what happens to her family, even if her very life is on the line. Pierce stages some splendid and disturbing sequences in the house, as Ruth’s safety is imperiled again and again. At one juncture, a lightning flash reveals the killer standing at the kitchen door in darkest night. On another occasion -- while Ruth is on the phone -- she sees the shadow’s stranger lurking upstairs, hovering above her on the second floor. She runs for her life as the killer begins to slowly descend the staircase. In a scene that is reminiscent of the climax of Halloween (1978) but nonetheless highly effective, Ruth attempts to flee the killer in the house, only to find that he has braced something against the exterior door, thus making egress impossible. Ruth (like Laurie Strode) has to break the glass and remove the impediment, a wood board, to escape, and to run free into the dark, inhospitable night. These scenes are authentically scary, and they are, for all practical purposes, the heart of the film. The Evictors concerns one woman -- disbelieved -- forced to rely on her own auspices in a time of precious little autonomy, if she wishes to survive. The film also plays cleverly with the idea of Ruth arming herself, and taking her defense into her own hands. There are, clearly, advantages and disadvantages to handing a loaded gun off to someone only minimally-trained in its usage. The Evictors plays on our expectations involving that gun, and in a manner that will drive you up the wall, as Ruth's danger grows, and a tragedy can't be averted. My wife, who found herself unable to divert her attention away from the colorful The Town that Dreaded Sundown, liked The Evictors but felt that the trick ending was just too much. I've read the same complaint online. Basically, we finally learn the identity of the stranger and his conspirators, but do so by the appearance of a prop (broken glasses) that, by this juncture in 1947 -- nineteen years since the original eviction -- should have been fixed, no doubt. The ending is actually bit unsavory all the way around, considering what it portends for Ruth. It’s not the greatest or most effective note for the movie to go out on, but I felt that the coda didn’t mar the good work that had been done in the rest of the film. Michael Parks (Red State) delivers a solid (if infuriating…) performance as the useless husband, but the film belongs to Harper. She is affecting as a sort of early “final girl” type in the immediate post-Halloween aftermath, before the onslaught of the 1980s. Harper's Ruth takes the time to learn about the house and its mysteries, seeks out help, attempts to defend herself, and fights ably against those who wish her ill-will. 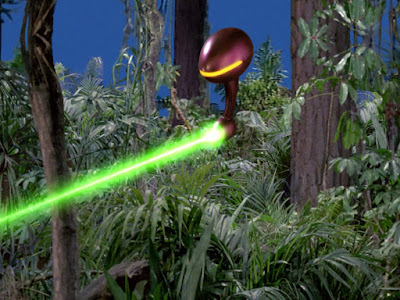 It’s too bad the movie doesn’t take the extra final step to reward Ruth for her insight and vigilance. The killers get the last laugh. The Evictors ends with reports of another series of murders at the Monroe House, and news that “to this day, the house remains vacant,” thus leaving open the possibility of a sequel that, sadly, never came. If you closely study The Evictors, the film also explores the idea that a social evil (even a legal one, like eviction), is bound to be met with another social evil. The original family never forgets its connection to the farmhouse, or that land, and so a legacy of terror grows around it. In today’s environment of myriad property foreclosures, it would be easy to remake The Evictors, set it in the present, and get rid of the silly eyeglasses coda. Why do it? If nothing else, a remake would draw attention back to the original film, which was a box office bomb but nonetheless represents the most effective, focused work of its late, great director, Charles B. Pierce.